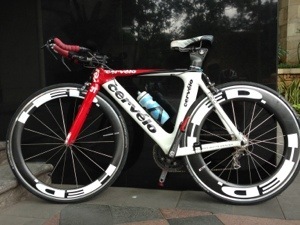 Today I took Z3D on a test drive up and down Sudirman with her new HED Jet wheels. It was quite a blustery day and I definitely had some hesitation in handling her when the gusts of wind came through but overall very happy with my purchase. On the flats was tapping 40KMH and maintaining that speed quite happily. Also the wheels make a speed lifting airplane sound as they get up to speed – altogether quite confidence boosting! Looking forward to next weekend when we take her on a sprint triathlon for a proper speed test! 2 Weeks to Busselton Ironman! !